New York is no longer the city with the biggest super-rich population. 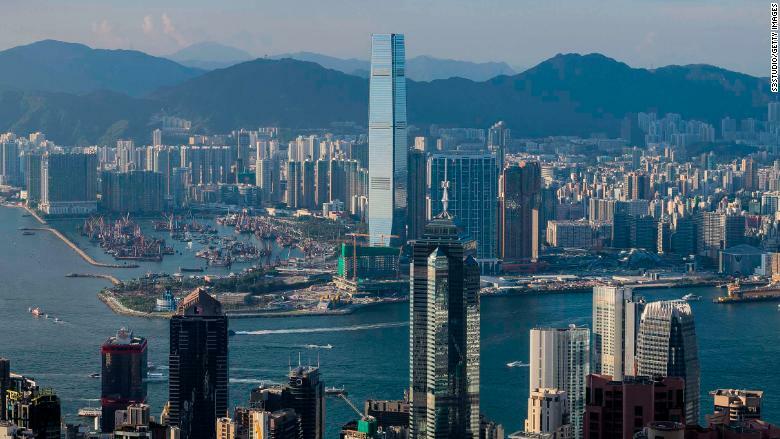 Hong Kong overtook the Big Apple to become the top destination for the planet's wealthiest people last year, according to a study published Thursday by research firm Wealth-X. The number of ultra-high-net-worth individuals (UHNWIs) residing in the Asian financial hub rose by almost a third in 2017 to 10,000, the study said. New York had held the top spot since Wealth-X first started ranking cities in 2011. The firm defines a UHNWI as a person worth $30 million or more. 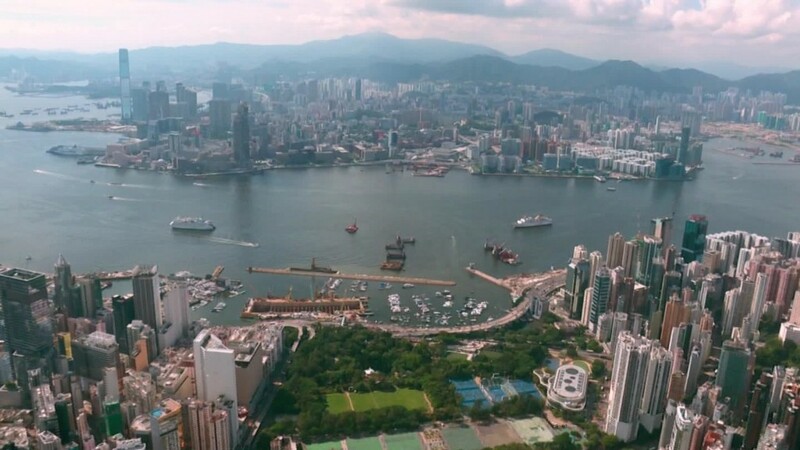 It said the rise in the number of ultra rich in Hong Kong was propelled by its booming stock market and growing financial links with the broader Chinese economy. China's rapid economic growth in recent decades has helped drive a dramatic increase in the number of ultra-rich people in the region. A view of Hong Kong skyline from Victoria Peak. Among Hong Kong's most prominent billionaires are Li Ka-shing, whose Cheung Kong (CKHUY) empire controls ports, telecommunications networks and energy companies across the globe. No single city in mainland China made it into Wealth-X's top 10 in terms of its number of super-rich individuals. It said that was because Chinese wealth was not concentrated in any one area, but distributed around the country. Its wealthiest citizens include tech tycoons Jack Ma and Pony Ma who founded internet juggernauts Alibaba (BABA) and Tencent (TCEHY), respectively. "The dynamism of wealth creation across China's vast landscape is nevertheless staggering," the report read. Overall, the United States remains the preferred country for the world's richest and is home to almost a third of the world's ultra-high-net-worth individuals. But Asia, and China in particular, are catching up. Last year the number of ultra-rich people in Asia rose by 20%. Rising Asian wealth has been helped by increasing consumer spending, more investment in infrastructure and economic reforms, among other factors, Wealth-X said. "Asia-Pacific is forecast to close the ultra-wealth gap with other regions over the next five years," the report added. For the past four years, the region's tally of people with $1 million in investable assets has been higher than anywhere else in the world, according to another study by consulting firm Capgemini. And by one estimate, China alone already has more billionaires than the United States. But things could get tougher in 2018. China faces headwinds from its trade war with the United States and the huge levels of debt in its financial system. Chinese stocks entered a bear market this year, while its currency has plunged versus the dollar. Globally, the number of ultra-rich individuals rose by 13% last year to more than 250,000. Their combined total wealth hit $31.5 trillion, boosted by an upturn in the global economy and good performances of stock markets. 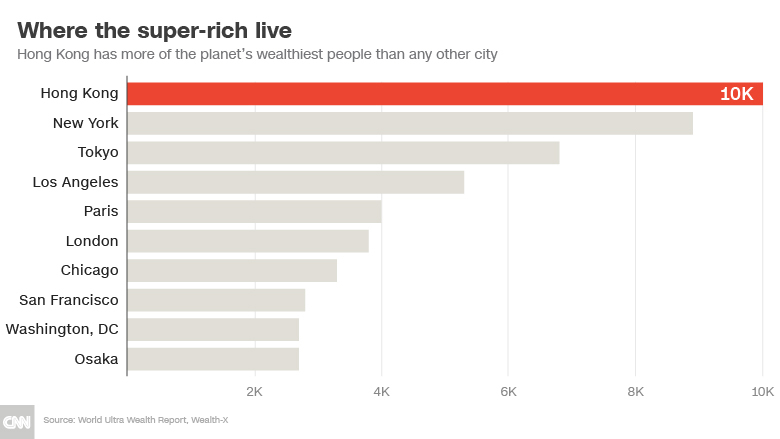 Other cities in the top 10 for global wealth included Tokyo, Los Angeles, Paris and London.